The power of a single story is immeasurable. When a young 26 year old woman from England traveled to Tanzania to study wild animals and share their stories, she transformed our understanding of our relationship to non-human animals, and what was possible for a woman in science, or in general. The reverberations of her story have echoed endlessly and caused the emergence of millions of other bold, unstoppable women. 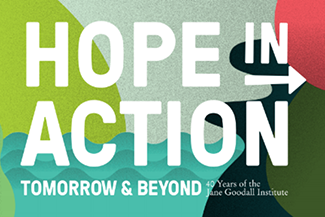 In Honor of the Jane Goodall Institute’s 40th anniversary, the Hope in Action campaign calls upon people everywhere who have been inspired in some way by Dr. Goodall’s message of hope, to share their stories. We want to celebrate all of you who are leaders and drivers of conservation, environmentalism, innovation and positivity, making the world better for people, animals, and the environment. You move us, and it’s time to show the world what the future of green looks like! To submit, simply click here and fill out the form with all the details of your tale of achievements for the benefit of people, animals, and the environment. The stories we’ve already received are remarkable, demonstrating how Dr. Goodall’s inner peace and message of hope has transformed our connection to the natural world. For World Environment Day, we want to provide you with a window into how profoundly Dr. Goodall’s voice has helped shaped the landscape of people working toward a greener #TomorrowandBeyond. Dr. Goodall has written multiple books discussing her absolute fondness for nature and the necessity of protecting ecosystems, including Seeds of Hope and has written that “The forest is for me a temple — a cathedral of tree canopies and dancing light.” For all those doing things every day on every scale – to stop pollution, protect forests, prevent erosion, and all other efforts to save the environment – we see and appreciate you! With your stories, we can create a movement of individuals just as propelled by a passion for the environment and conviction to act. As Dr. Goodall began as one person with a mesmerizing story of perseverance, kindness and brilliance, so each of your stories begin. There’s no telling who they will inspire, or how that inspiration will transform the world creating a brighter future for all living things! “I’ve always been inspired by Jane…in my high school environmental science class, in hearing Dr. Goodall speak at Sweet Briar College in the early 80s…to my friendship of celebrated sculptor Bart Walter (with have miniatures of his life sized chimps commissioned by Dr. Goodall) to reading her books and articles and learning of her remarkable generosity…to help us better understand chimps, ourselves and all life forms. 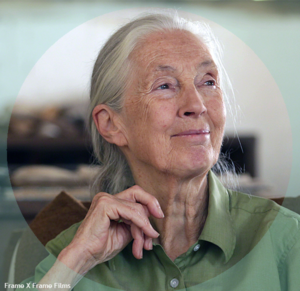 “When I was around 8 years old I found out about Dr. Goodall and the work she does for our environment. I learned about her passion for animals and her drive to help all of them and their environments. “I read ‘Harvest for Hope’ in high school and it completely changed my view not only of food, but of the interconnectedness that animals must bear with humans. I immediately became a stalwart vegetarian and began educating myself further about the environment. Passion and perseverance must pay off, because, as of a month ago, my strengthening commitment to the natural world became manifest in a position with the National Audubon Society! I owe much of my love of the earth and its creatures to Dr. Goodall, and plan to make my life’s work the healing of the planet and the promotion of its welfare. “When my mom started reading me stories about Dr. Goodall and how she studied chimps and helped protect them. I was 5 when I first started leaning about how she has helped the environment.